Knowledge synthesis is a term used to describe the method of synthesizing results from individual studies and interpreting these results within the context of global evidence. These methods can be used to understand inconsistencies across studies and identify gaps in the literature for future research endeavours. Knowledge translation focusing on the results of individual studies may be misleading due to bias in their methods or random variations in findings. As such, knowledge synthesis should be considered the base unit of knowledge translation. 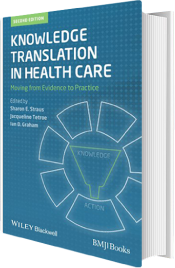 Within health care, knowledge synthesis activities have focused on rigorous systematic review methods, such as those proposed by the Cochrane Collaboration. a systematic presentation, and synthesis, of the characteristics and findings of the included studies”.